Province of BC's lawyer trying to say critical milestones will be missed if work is stopped in the key areas of the #SiteC site that First Nations requesting be preserved while the rest of the case is heard. No talk of extensive delays due to geotechnical instability at site. BC lawyer referring to seasonal nature of work - that a delay of 2 months will impact work that can only be done in summer, some only in winter - i.e. a 2 month delay might mean a whole year delay because time of year critical. 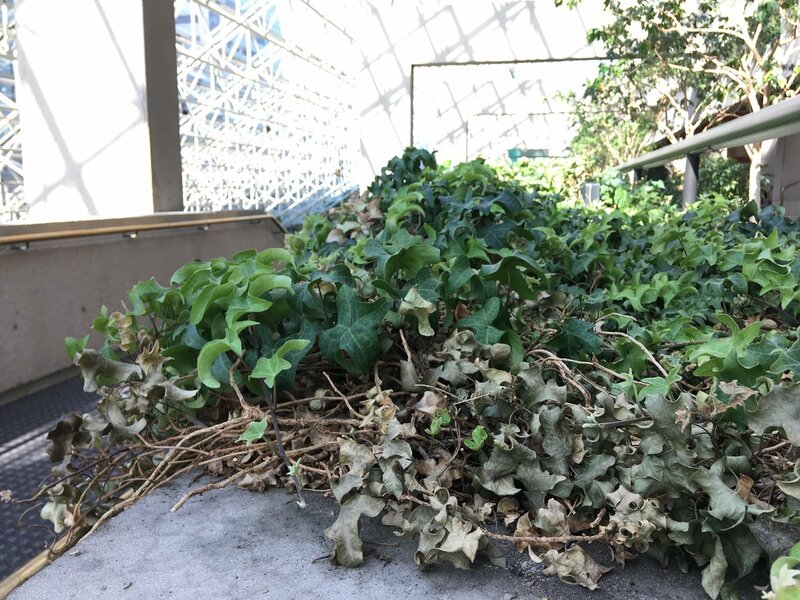 Editorial note: the disrespectful & I would say racist tone of the BC Hydro lawyers who presented in August - dismissiveness bordering on mockery of FN arguments - is absent so far. Perhaps BC govt & BC Hydro legal representation might be seen as a sort of good cop/bad cop duo? As @galenjoel says, the cost of this injunction to BC is paltry compared to the cost to BC of a dam we don't need and that can't be reasonably built on shifting silt on Treaty 8 territory. BC lawyer saying the #sitecinjunction to stop clearing certain areas is "invasive" to BC Hydro's project. "This injunction drives a truck through our project," he says, which oddly mirrors the damage being done to the last intact area of NE BC, the #SiteC site. @galenjoel What's happening right now is a detailed discussion by BC's lawyer about each area at #Sitec that the Dunne-za First Nations are asking in this #SiteCInjunction not to be disturbed until Treaty case is resolved. Without a detailed map of #SiteC it's hard to relay these details. This is actually happening. Harry Swain chaired the Prov-Federal Joint Review Panel on #SiteC. 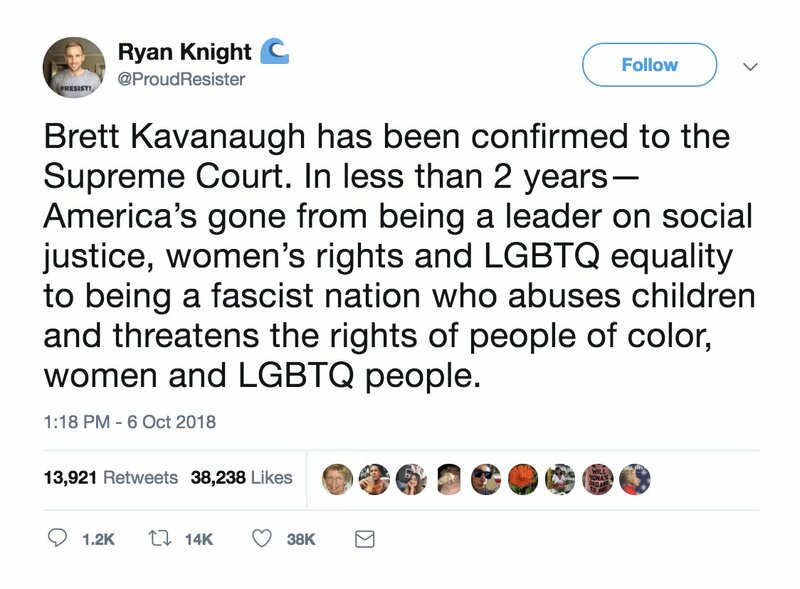 You can't make this stuff up. We are now overtime. BC Hydro lawyer going on about striking out testimony and other precedents. One such case he's referring to sounds like Westeros. Mr. Drown was absurd enough. What is he saying? Westerhof? Ok we are adjourned for today. See you all tomorrow! BC Hydro has finished its submission. Now the lawyer from the Province of BC is presenting (sorry, will try to get her name). She's going to be talking about the regulatory structure [! given the province has gutted the power of the regulator, the BCUC]. @sage_legal Lawyer saying BC Hydro is constructing #SiteC acc to the [so-called] Clean Energy Act [which restricts Hydro to only dams, no new technology], detailing its characteristics. Acknowledges that BC has duty to consult with West Moberly FN re impacts on their treaty rights. From Craig Benjamin of Amnesty International Canada. Indeed! Why is it up to First Nations to assert Canadian law on their own dime? Hydro and govts should have operated within the law from the beginning. @WitnessthePeace One of the things you notice in the BC/BC Hydro legal submissions is a narrowed view of #IndigenousRights and a very nostalgic, even paternalistic interpretation of what "traditional" uses means. Is it for the Crown to decide what is,and always will be, "traditional"? Note that this is my own digression. The Crown isn't explicitly challenging "tradition" but BC/Hydro seem to be everywhere implying that they aren't damaging the traditional way of life guaranteed by Treaty 8. Who are they to determine what the continuity of tradition looks like? Excellent points on #SiteC @YuLeoW ! 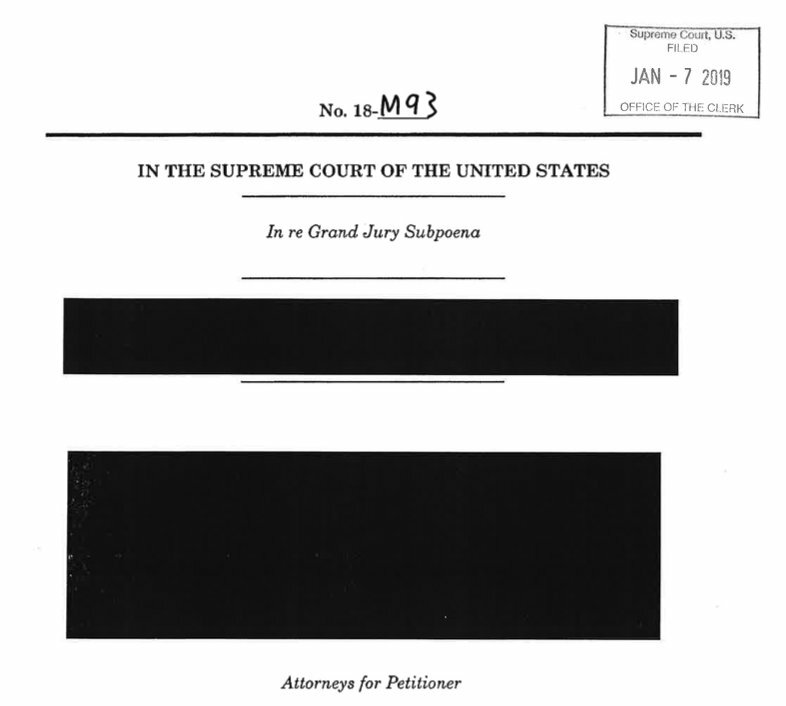 @BCUtilitiesCom @sage_legal @jjhorgan @GeorgeHeyman @michellemungall Lawyer now referring to extensive court documents the judge can see but we don't have access to. Relate to complex & overlapping permit regions for all the activities at #SiteC (deforestation, digging, etc). These are overlaid onto the map of critical areas ID'd by First Nations. @BCUtilitiesCom @sage_legal @jjhorgan @GeorgeHeyman @michellemungall Judge Milman intercedes to ask what her point is - i.e. if he grants the injunction, these permits will be "waylaid"? She says I don't know about waylaid but it will be complicated. She says the areas injunction wants to protect are large. Judge evidencing faint impatience. Judge effectively asking BC Govt lawyer "what's your point?" and it's a question I have myself. Seems the lawyer is saying that if they had to redo all these permits and activities it significantly changes the Crown's role at the site and might involve greater direct administration? @dunnezaman We're on a short break now. Effectively the last section was about "balancing interests" but it is very hard to see that deleterious effects i.e. treaty infringements can be "balanced" or mitigated" when you're building a mega-dam. Impacts of dam will hit entire surrounding area. @dunnezaman This just can't be framed as a "balancing of interests" between BC Hydro (for power we don't need) and First Nations; this is an either/or scenario, and if they lose, First Nations will lose the last unimpacted bit of land in NE BC, land crucial for ecology, fishing, continuity. .. cont'd - but not specific areas - there are no specific cases in Canada that says this is infringement by law, that they can't exercise rights in traditional territory unless on specific area within treaty boundaries." It will be interesting to see rebuttal to this. Just to back up a bit, a Peace River local provides more information about the ancient "tufa seeps" at risk from #SIteC. "These are ancient seeps, older than the great wall & Gardens of Babylon. @bchydro says they can replicate them. Wait, What?" BC govt lawyer defending evidence by provincial employee Mr. Addison whose work the plaintiffs have questioned - I'm sorry not to have background on this portion of the case but province here seems to be discounting Swain's evidence & promoting that of others. @WitnessthePeace I'm trying to sort this out. @WitnessthePeace Canada lawyer saying the time and place for West Moberly to challenge was in earlier cases. She's now reviewing a number of earlier precedents - it's going too fast for me to report. Will try to switch to figuring out the larger thrust of this argument. @WitnessthePeace @rrrwong @rrrwong Yes but it seems she's cherry-picking here, under the guise of concern about deliberative secrecy. No? @WitnessthePeace @rrrwong @SusanFDe @sage_legal Judge asking whose privilege is it? Project proponents often try to pierce the veil. Here it's different when you have a decision maker piercing the veil of secrecy. Mogerman now talking about logging activity in some of the construction areas - saying there's actually very little going on in some of these areas that are used for spiritual purposes (you go there to get quiet) - Judge says "how is that irreparable." Mogerman - Because I don't get that time back. Where you have a site that has spiritual value then you have a different way. At Rocky Mountain camp area, Dancing Rock & the spiritual value of the area on the south bank where trees will be coming down..
SCC in Mikisew case (Judge McLachlan) talking about ceding some traditional harvesting rights but don't cede all other cultural uses. 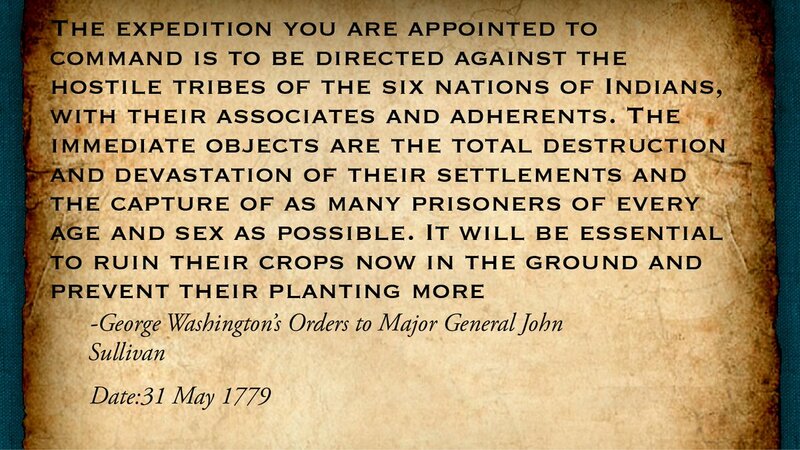 They have a package of rights and they ceded some rights to the land in return for certain promises. Are they other rights beyond treaty rights? Bit of an outburst from BCHdro lawyer Willms just now after Mogerman characterized what Hydro said as 'everything is gone" - and now we are breaking for a shorter lunch as we are running behind. Glad one journalist is here! There has been a noticeable and surprising absence of media in this courtroom. Mogerman: hard to follow (speed!) but Q is has the crown's conduct over many years infringed on PRFN (Prophet River First Nations)'s activities. 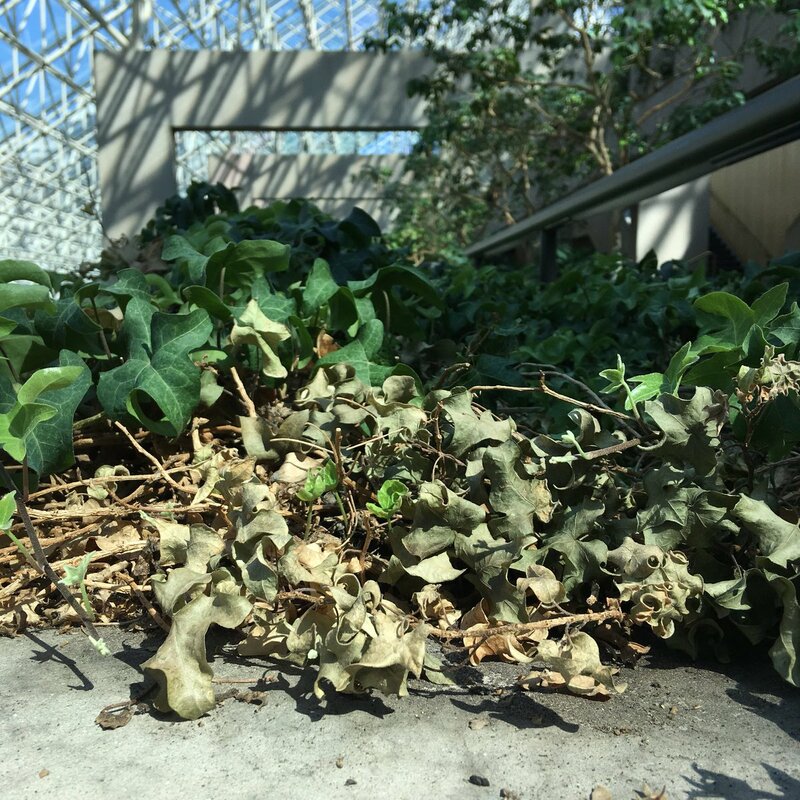 Each new incursion serves to further narrow habitat - each more signif than the last & should be characterized as "irreparable harm"
We are adjourned for today, starting again at 9 am. I cannot be in court tomorrow but I will pick up this thread when the video becomes available for the final day! In my absence please follow the hashtags #SiteC #SiteCInjunction #bcpoli & @WitnessthePeace @FightSiteC Bye! 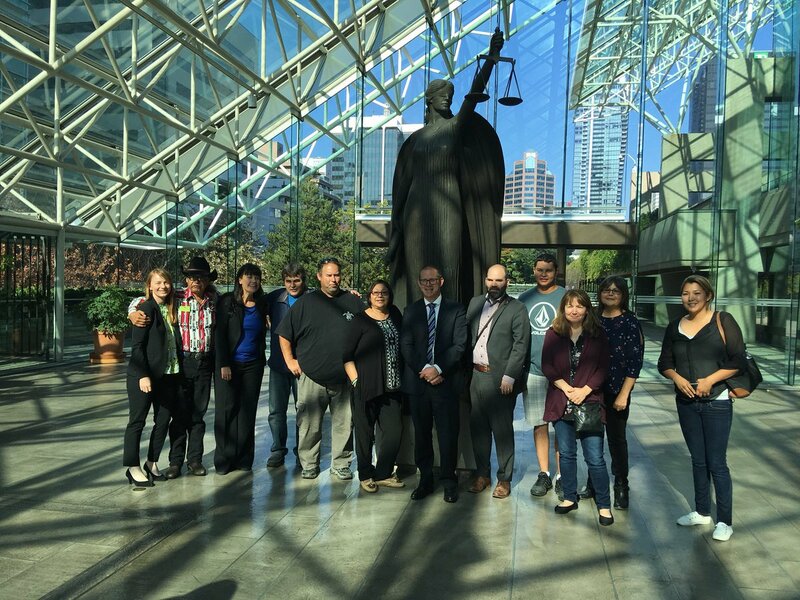 ..West Moberly and Prophet River First Nations with the @sage_legal team at the end of the penultimate day of the #SiteCInjunction in BC@Supreme Court #SiteC #bcpoli. Good luck tomorrow! @UBCIC @Dave_Eby "BC Hydro has consistently defended itself by claiming that its meetings with First Nations constitute meaningful consultation. 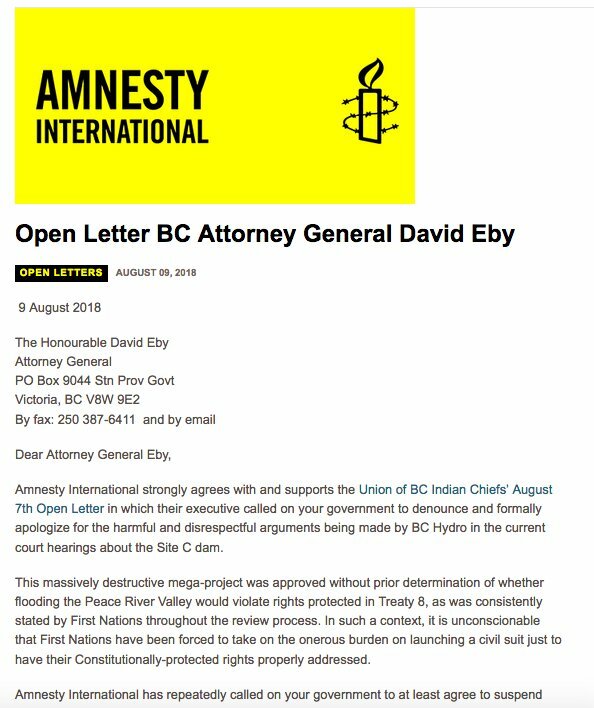 However, BC Hydro's arguments in court demonstrate a profound disrespect for Indigenous knowledge & an inability to listen to & learn from our elders.."
@UBCIC @Dave_Eby ... "BC Hydro's arguments in court cast doubt on the corporation's ability or intent to engage in anything resembling meaningful consultation." - @ubcic. @UBCIC @Dave_Eby @AmnestyNow Jokes as we left courtroom for break in #Sitecinjunction. "Is this case about deciding who's doing "irreparable harm" to whom, BC Hydro vs First Nations?!" (Treaty terminology) 2. 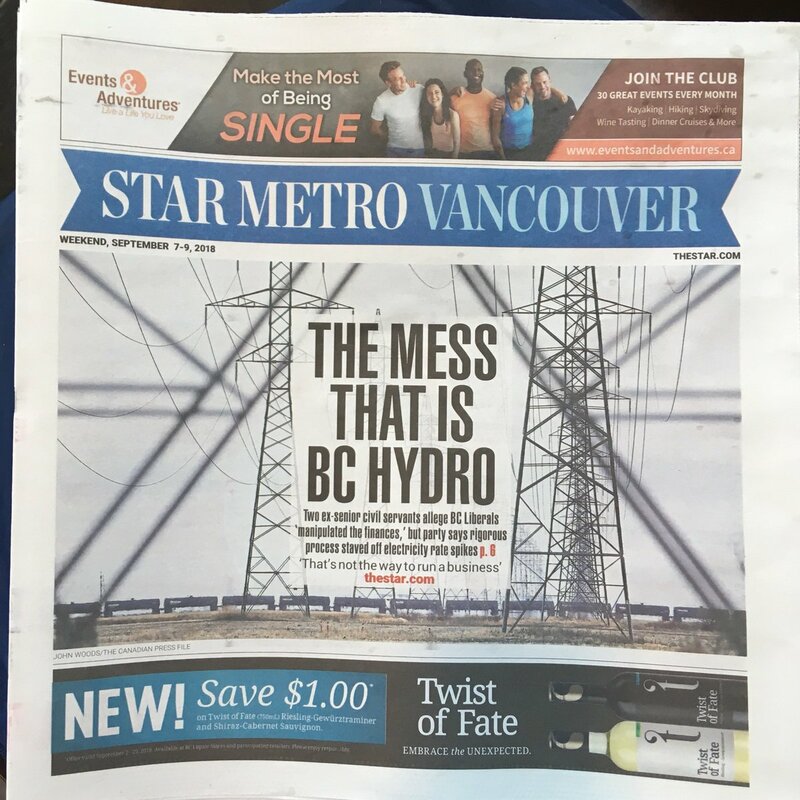 "If Hydro is talking about irreparable harm to itself, blame the BC Liberals for indebting Hydro!" @UBCIC @Dave_Eby @AmnestyNow Good analysis. 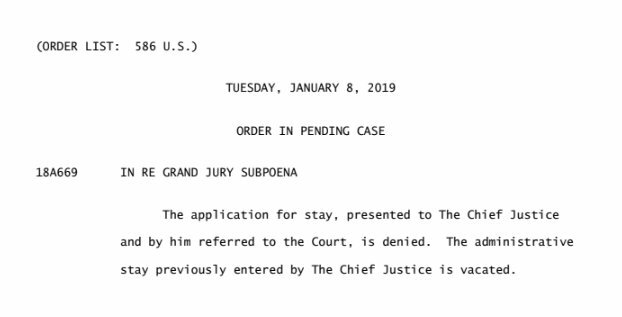 BREAKING: Supreme Court denies the foreign country-owned company's request to stay a contempt order resulting from its refusal to comply with a grand jury's subpoena. Chief Justice Roberts' "administrative stay" is vacated, so the result is the contempt order is back in effect. That order of the court follows this request, made Monday but put on the docket today, to file a cert petition in the case under seal. Not clear what will happen with that now, but the contempt order (and associated fines) will now be back in place. In honor of this profoundly ignorant tweet, we need to educate people more than ever about the real American history. So one like = one atrocity committed by the US. 2. George Washington used his slaves teeth to get his dentures made. It was common practice in the day for Dentists to "buy" teeth from slaves to use as dentures. I wish all Americans a Happy 4th of July. I hope you celebrate and take the day to appreciate our remarkable Republic. For me, the 4th of July is a somewhat melancholy day—the American Republic seems ailing, and has for some time. Can the American experiment work? One of my habits is to reread the Federalist Papers on the 4th of July. I know, that’s not normal, but it’s proven a good habit for me. #Aadhaar case to be heard today by a 5-Judge Constitution Bench of the Supreme Court for interim relief. Judges who would be hearing the matter: CJI Dipak Misra, A.K. Sikri, A.M. Khanwilkar, D.Y. Chandrachud and Ashok Bhushan. Hearing for #Aadhaar interim relief has started. When I was growing up my Pop told me that there are two things certain - the govt can't be trusted and Aus doesn't want you to succeed. He was right - I have been put down at every opportunity by the power brokers and those that gain from oppression. He taught me that every time I showed throat - they would try to slit it. But we've survived worse and it shouldn't stop me showing throat.